Physically Bold Comedy is a fast-paced comedic variety hour starring the character, improv and video sketch talents of Physically Bold. 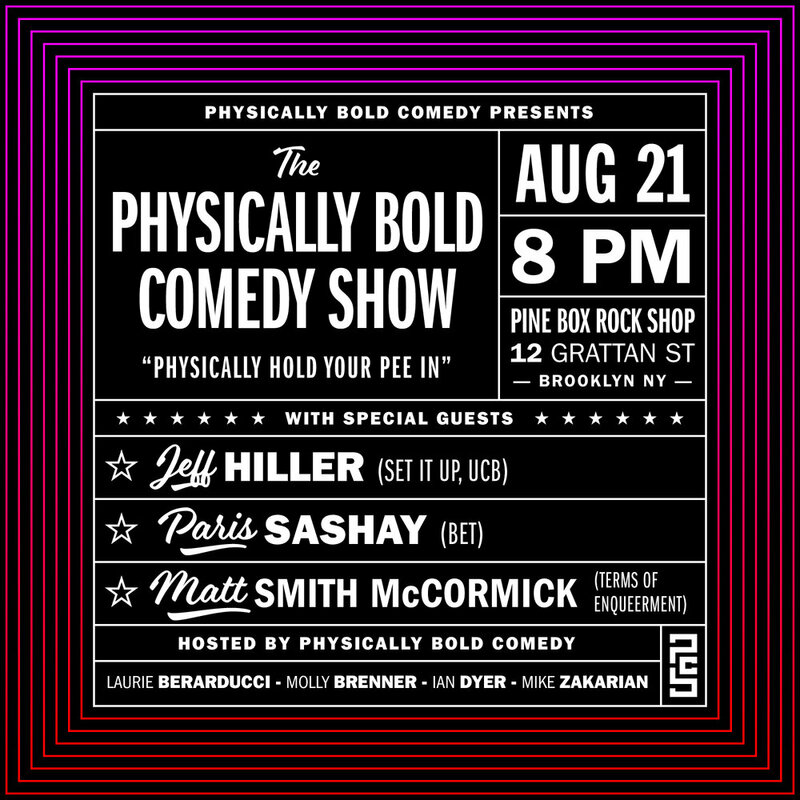 On August 21st, at the Pine Box, Physically Bold will debut a brand new sketch, new material of their own and the amazing talents of Paris Sashay, Jeff Hiller, Matt Smith McCormick and more! Every month, Physically Bold plays host to some of New York’s finest stand up comics, character performers and sketch teams, in addition to debuting their own latest work. Featuring talents from all over New York City, previous shows have featured Julio Torres (SNL), Gary Richardson (Don’t Think Twice and UCB’s The Law Firm), Kenice Mobley (2 Dope Queens), Lily Du (The President's Show), and Sydnee Washington. It's Physically Bold's first hosted Improv show, and it's on a Thursday, so that means its the start of a Three Day Weekend y'all! We've got Just a Phase, and two other killer improv teams, plus Physically Bold performing, and we promise you it's going to be a great time. We'll have the best of the best from the NYC improv scene and beyond. Come on out to Muchmore's to start your weekend right: by getting way too drunk for a Thursday night. Physically Bold Comedy is a fast-paced comedic variety hour starring the character, improv and video sketch talents of Physically Bold. On September 18, at the Pine Box, Physically Bold will debut a brand new sketch, new material of their own and the amazing talents of stand up and character performers from all across NYC! Physically Bold Comedy is a fast-paced comedic variety hour starring the character, improv and video sketch talents of Physically Bold. On October 16, at the Pine Box, Physically Bold will debut a brand new sketch, new material of their own and the amazing talents of stand up and character performers from all across NYC! 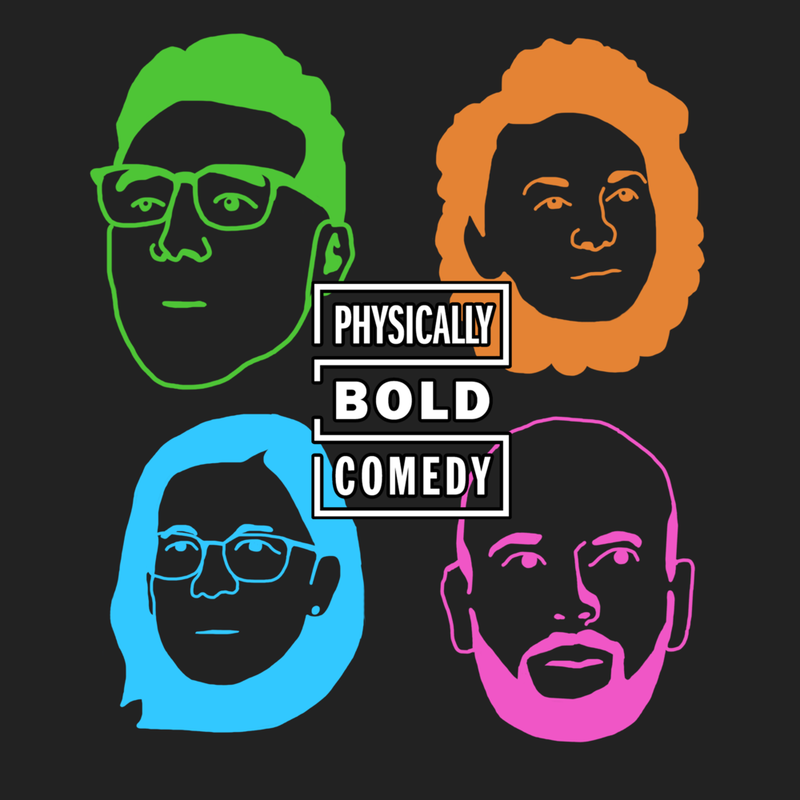 Physically Bold Comedy is a fast-paced comedic variety hour starring the character, improv and video sketch talents of Physically Bold. On November 20th at the Pine Box, Physically Bold will debut a brand new sketch, new material of their own and the amazing talents of Julio Torres (SNL), Sydnee Washington and more! Every month, Physically Bold plays host to some of New York’s finest stand up comics, character performers and sketch teams, in addition to debuting their own latest work. Featuring talents from all over New York City, previous shows have featured Gary Richardson (Don’t Think Twice and UCB’s The Law Firm), Kenice Mobley (2 Dope Queens), Lily Du (The President's Show), Amanda Giobbi and Kelley Quinn (UCB, PowerHour), and Eric Feurer (UCB’s Characters Welcome). 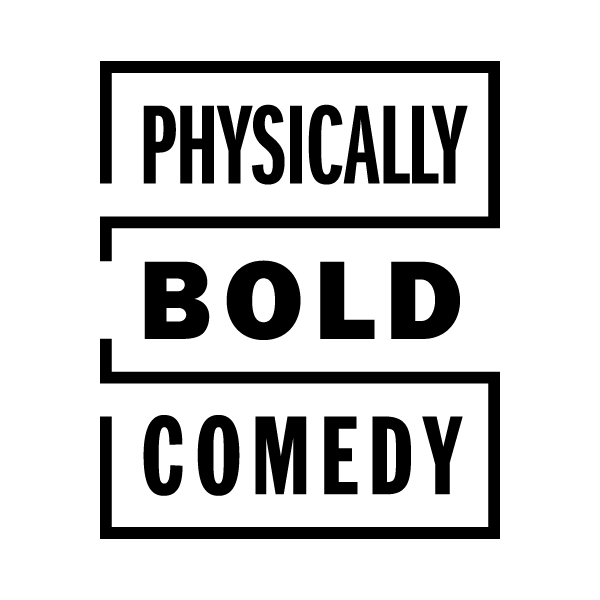 Physically Bold Comedy is a fast-paced comedic variety hour starring the character, improv and video sketch talents of Physically Bold. On December 18th at the Pine Box, Physically Bold will debut a brand new sketch, new material of their own and the amazing talents of Julio Torres (SNL), Sydnee Washington and more!